Unfortunately, the parameter is always null in the server. We then realized that the serialization of the array is wrong. But why? 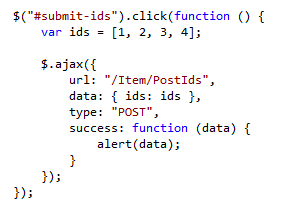 Let’s take a look at jQuery’s documentation, more specifically about jquery.Ajax() data setting. data: Data to be sent to the server. 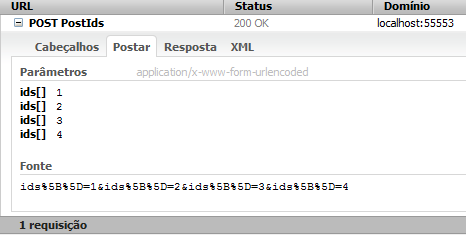 It is converted to a query string, if not already a string. It’s appended to the url for GET-requests. See processData option to prevent this automatic processing. Object must be Key/Value pairs. 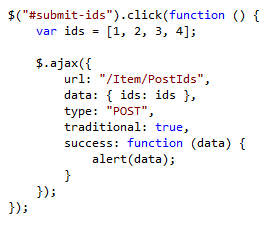 If value is an Array, jQuery serializes multiple values with same key based on the value of the traditional setting. Now, we know the reason. Due to the way other web frameworks handle JSON parameters, jQuery serialization changed the way arrays are serialized. Therefore, we as .NET developers need to use the traditional = true setting. And Boommmm… it works perfectly. Let’s take a look at the request’s paremeters.